In this blog post I want to discuss a code injection vulnerability in VMware Horizon‘s macOS Client Version 4.4.0 (5164329) that can be abused to gain local root privileges. The good news is, that it has already been fixed in the latest available version. I found it after learning about the “Open VMware View Client Services” SUID binary on my Mac. I think it is used internally by Horizon’s remote USB services and is only exploitable after they have been started once by entering administrative credentials. To investigate the binary further, I used the newly released Fireeye application Monitor.app. It basically is Process Monitor (procmon) for macOS. 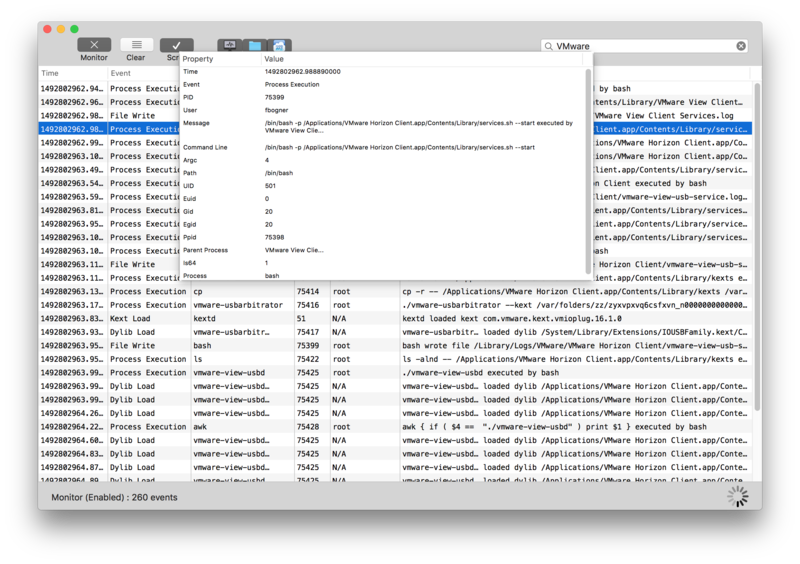 Based on the activities as captured by Monitor.app it was clear that “Open VMware View Client Services” was basically a wrapper around “services.sh”. This makes sense as the SUID bit is ignored for script files. After taking a closer look at this script, I identified the highlighted line in the following screenshot as a starting point for a possible code injection vulnerability. 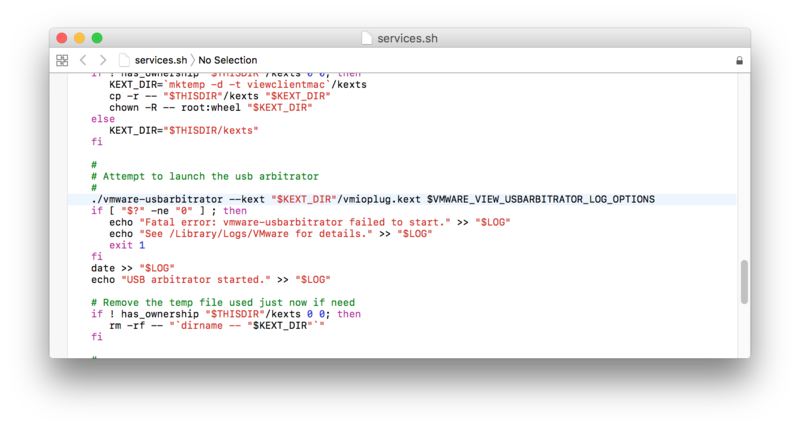 Although I had no idea about the inner workings of “./vmware-usbarbitrator” this binary was immediately my focus for further investigations. The reason for this is that I – as a non-admin user – am able to set the content of the environment variable VMWARE_VIEW_USBARBITRATOR_LOG_OPTIONS – that is used in an SUID executed script. After taking a closer look at the possible command line options I was pretty sure I could abuse this setup to load a custom kernel extension by abusing the –kext flag. Additionally, KEXTs the have to be signed by Apple. In the course of this LPE I will ignore issue #2. Hence, I disabled SIP. 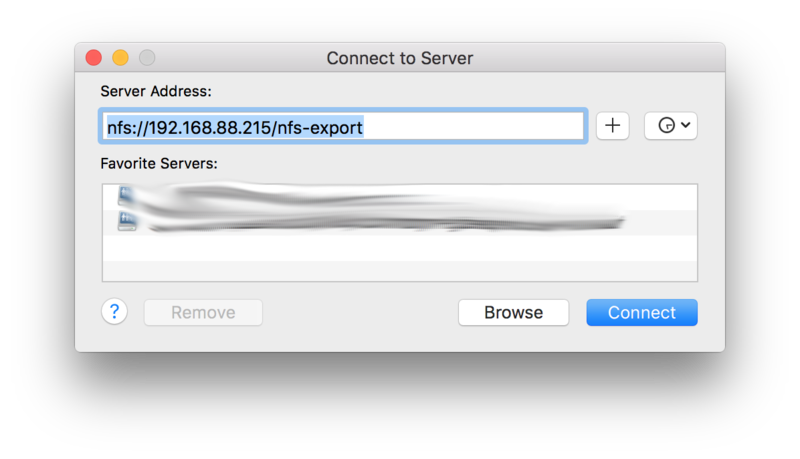 … and mount it using Finder’s “Connect to Server”. and updating the Info.plist file to meet the requirements (simply add a dictionary “IOKitPersonalities”) we are ready! After copying this KEXT to the NFS server and adapting its permissions to meet the “root:wheel” requirement, we are finally able to start the real exploitation. To do so simply set the “VMWARE_VIEW_USBARBITRATOR_LOG_OPTIONS” environment variable to our previously create KEXT and run “Open VMware View Client Services”. This is enough to load it! Hence, we gained code execution from a normal user’s account within the kernel context! Filter or clear the environment variables VMWARE_VIEW_USBARBITRATOR_LOG_OPTIONS and VMWARE_VIEW_USBD_LOG_OPTIONS.